Entering the Rock Cut at the Neebish Island ferry, Oct. 17, 2016. Special features of the barge Huron Spirit, built in 1995 at Jiangdu Shipyard, Tiangsu Province, China, include 150-foot self-unloading conveyor boom ideal for efficient discharge of bulk commodities. The vessel has additional deck strength capable of carrying steel and other breakbulk cargoes while still maintaining maximum 18.5-foot draft for shallow port and dock accessibility. The barge was christened at the Southwestern Sales terminal in the Port of Windsor by Ginny Grant, daughter of Cheryl Sylvestre, president of Southwestern Sales. At the same time, Bunny Melander, mother of Kathy McKeil, christened the Leonard M, a new tug also owned by McKeil Marine. 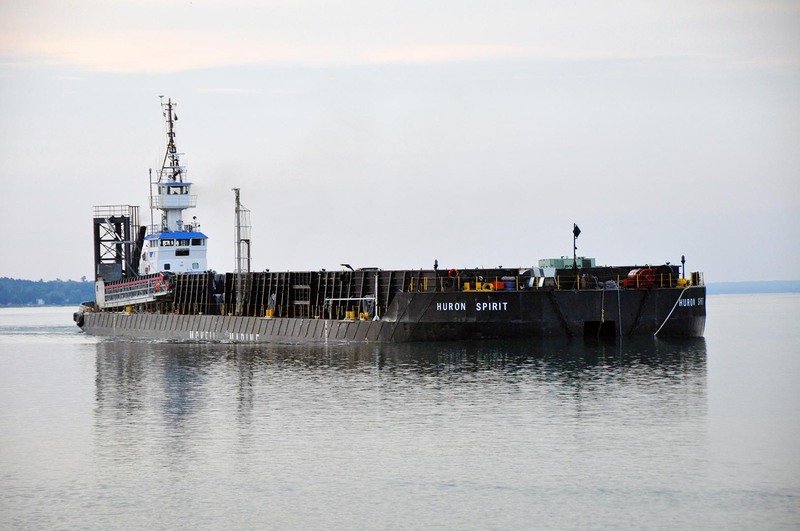 Huron Spirit is mainly used to carry construction-related bulk materials and heavier bulk such as steel coils on Lake Superior, Lake Michigan, Lake Huron and Lake Erie. It’s designed with a strengthened deck to allow it to carry varied cargoes in a smaller deck footprint. It is also fitted with a 150-foot self-unloading boom that allows transfer of cargo such as stone to shore terminals without need for dock operators or cranes. It makes regular runs between Windsor, Detroit, Toledo, Cleveland, Chicago, Burns Harbor, Marblehead, Cedarville, Rogers City, Kingsville and Sault Ste. Marie. Leonard M. and Huron Spirit at Port Huron, July 17, 2016. Sharon MI pushing the Huron Spirit, April 25, 2017. Copyright © Boatnerd.com. All Rights Reserved.